PRT – “personal rapid transit” – is one of those perennial concepts that never quite makes it. An example of PRT is London’s Heathrow Airport ULTra, one of the few operational systems in the world. (http://www.ultraglobalprt.com/wheres-it-used/heathrow-t5/ ). There is apparently a Seattle PRT advocacy group, judging by the website at http://www.gettherefast.org/ , although I haven’t seen anyone “representing” much on STB. The glorious vision of a typical PRT advocate is a citywide grid of grade-separated guideways, with autonomous “pods” carrying 1-4 passengers. Each trip is direct from origin to destination with no intermediate stops, automatically routed through the grid. As far as I know, nothing even close to this has ever been built. In this concept, the PRT pods are designed with the goal of carrying a single bicycle, with its mounted rider. This, makes for a small, light pod, which is the most important cost factor in engineering the whole system. The closest approach I have seen to this small a PRT pod is the two-passenger proposal from ecoPRT in North Carolina http://ecoprt.com/ shown above. 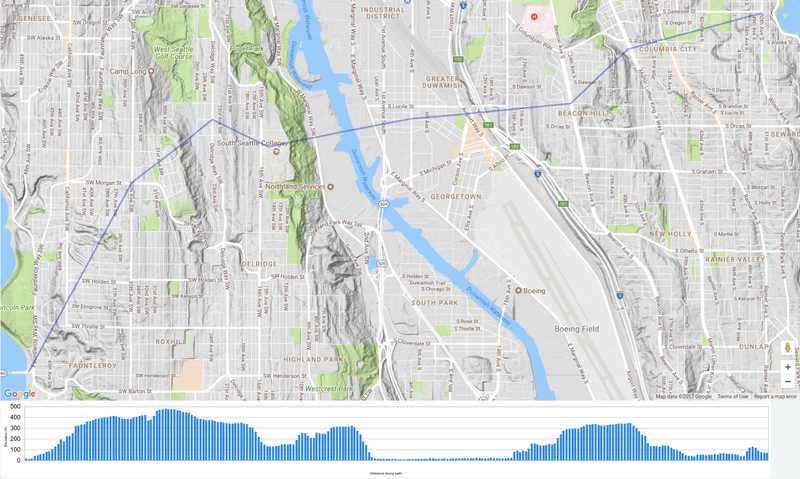 A major role of bicycle PRT in Seattle would be to get people up hills. Bicycle commuting (and other trips) would be attractive to many more people if they didn’t have to struggle up hills. In the distant future, one can imagine the citywide-grid PRT vision, supporting relatively long-distance travel, above the traffic, protected from the weather. Since such a system is connecting “ride-sheds” rather than walksheds, it could place the entire city within 5 minutes of transit using a pretty coarse grid. Note that this vision dovetails perfectly with ubiquitous, cheap bikeshare (extrapolating from this year’s pilot program in Seattle). I have no idea whether the grand vision of a PRT grid could ever pencil out. However it seems to me that a limited set of hill-hopping routes (primarily East-West) would very likely meet enough demand to justify themselves. They do not need the “network effect”: even one line would provide a valuable service. Even so, this sounds like a major investment in unproven technology. What we need first is a pilot project, a technology demonstrator. Such a pilot would most likely be a temporary installation, a learning experience. How could this work? I have my eye on Union Street from Alaskan Way up to 1st Ave with a middle stop at Western/Post Alley. It’s a really short run, currently impassable by bike, in a busy neighborhood. It supports three stops, so that the PRT feature (bypassing unused stops) can be demonstrated. How could it be funded? I don’t claim to have any business sense, but one idea is that the initial demonstrator be a proprietary system installed by one of the bikeshare companies. Ride the PRT only on a Limebike, for example. Let the wild-eyed venture capitalists behind the new bikeshare companies take the risk. If it turns out to be technically sound, a public-access system can be built on the same principles, and deployed around the city in appropriate places.